Nakazawa Shinichi was born in Tokyo in 1956. He is a self-taught artist who works in the unusual combination of copperplate etching with gold or silver leaf. Nakazawa-san’s inspiration is 17th century artist Sotatsu, who was famous for his decorative screens featuring gold leaf, poetic imagery, and a high degree of emotional intensity. 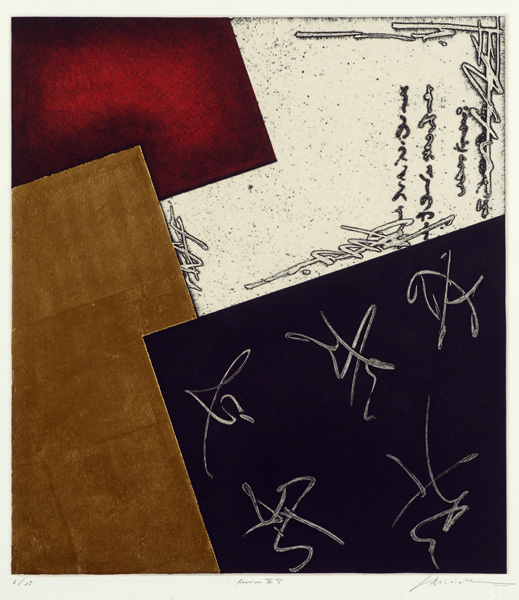 In contrast, many of Nakazawa-san’s prints are characterized by a quiet, almost meditative calm. Their background often contains what appears to be hiragana or Japanese calligraphy, perhaps a fragment of a poem. In fact, this is a secret ‘language’ created by Nakazawa-san. He has exhibited at the Pratt Graphic Association and Pratt/Silvermine International Print Exhibit in New York, Japan Week in Cairo; The Hameenlinna Art Museum, Finland, the Canberra Museum and Gallery, as well as at numerous galleries and museums in Japan.